1.2 1) How to Remove Memory Card Password on PC? 2 Backup Your Data From Facebook With A Simple Trick. Many people try to secure their photos and data of their memory card by keeping a password to it. By keeping the password to the Memory card can secure their whole data safely. But sometimes they will forget the password of the SD card. So without a password, we cannot access atleast one file from the Sd memory card. Manually we cannot remove the password. So today I am going to teach you a tutorial on “How to Remove/Unlock/Recover the Sd card Password“. Here you can see 4 methods to recover the sd card password. So follow the simple steps to unlock the memory card. They are 4 methods to Recover your data from the memory card by unlocking the Sd card. Using these methods you can easily unlock your memory card easily. So follow the step and unlock the SD card successfully. Let us discuss the methods clearly. With out wasting the time let us go in the tutorial. 1) How to Remove Memory Card Password on PC? Open the File Manager in the Mobile. Click on System folder in the settings. Search for the file name “mncstore” there. Send that file to Pc or Computer or Laptop. Now Open the file in Notepad. You will see the Password of the Memory card in the file which you opened. You can easily implement this trick in any of the Android phone or any device which has a folder “mncstore” in it. With this folder. 2) How to Recover Memory Card Password using Software? Remove the Memory card from the device first. Now insert it in another device. Connect to pc or laptop. Now you can have a memory with password removed or Unlocked. 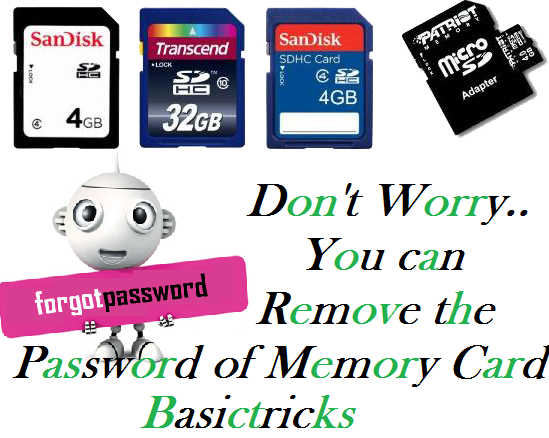 3) How to Remove Password from Memory Card? Remove the sd card and insert in any one of the N-Series of Nokia mobile. That’s it!! It don’t ask you the Password now. 4) How to Unlock Micro Sd Memory Card Password? To scan the files in your mobile. You need to Download an explorer to scan the files. Open the explorer and enter zero, Which will help you to see the System files. Search for a file called “mncstore“. You may find it at the Path: System/Data/mncstore. Delete the code in order to unlock the memory card or Reset the Memory card. These are the 4 method which where used to unlock the Memory card. So be careful while doing. Have a successful in removing the password of the sd card. I hope this tutorial “How to Remove or Unlock the Memory card password” will help you to unlock your memory card when it has been locked. Like us and share the Post with your friends and try to help them. Share your questions with your friends and we will solve the problems. how to unlock memory card / memory card password remover / memory card password unlocker / how to unlock a memory card / forgot memory card password / how to unlock micro sd card / how to break memory card password in pc / sd card recovery. using n series v can format the sd. but wat about my files?